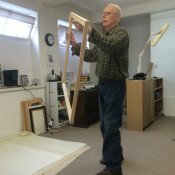 The New Year 2017 has already brought changes to Frederick Phillips Art, and already seems set to continue in much the same vein as 2016...Throughout his career, the artist has always worked and lived within the same building. But in April 2016 he became one of the first artists to move into the newly-developed ACAVA Artists' Studios at the former Spode Works pottery factory in Stoke-on-Trent. The site is being renovated as a 'creative village' which, along with the remodelling of the Spode Visitor's Centre and Museum, has the aim of bringing visitors to this historic heritage site as well as stimulating the economy of the town. Although the Spode site is a little like a building site at the moment, the forty-three Artist's Studio are almost fully-occupied and a stimulating and productive artistic community is beginning to thrive. A new studio required a facelift in other areas and so in January this website was redesigned and simplified, placing more emphasis on the images themselves. Please visit this blog often for news and occasional special offers!